TEAM Industries designs and supplies a variety of locking differentials, limited slip differentials, axles and related products. 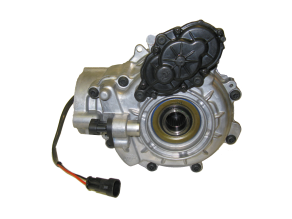 These products range from simple spool axles (no differential) to sophisticated electronic locking differentials and traction control systems. TEAM’s patented SmartLocker™ Electronic Traction Control differential provides the most elegant and sophisticated traction control system available for ATVs, UTVs and light automotive vehicles. The SmartLocker is an automotive style four- wheel-drive (4WD) system that provides true all-wheel drive (AWD) traction automatically and on the fly. On surfaces with good traction, a vehicle equipped with the SmartLocker differential system will operate with a turf-friendly, easy-steering open differential. On slippery surfaces or while climbing obstacles, the system will detect the amount of slip and automatically send power to the tractive wheel and decide how tight to lock the differential. The Smartlocker is programmable and, with TEAM’s automatic Disconnect, will automatically select 2WD, 3WD, or 4WD, as needed. SmartLocker technology has been developed for both front and rear axle applications. For less demanding applications, TEAM has developed and manufactured several limited slip differentials for both front and rear axles. These mechanical systems guarantee that at least some torque will be provided to each wheel. TEAM has also designed wet brake systems for small vehicle axle applications. These systems provide nearly maintenance-free, enclosed braking that can last for the life of the vehicle. We have patented systems for both spool-type rear axles and for axles with differentials. The latter system provides equal, un-biased braking of both wheels, while still permitting the differential to function as intended. The use of larger, more powerful engines in modern vehicles has created a need to limit drivetrain torque spikes in some applications. TEAM has designed, patented and manufactured systems that limit the peak torque experienced by portions of the drivetrain during jumps and other maneuvers. These devices can be incorporated into propeller shafts, transmission outputs or axle inputs. TEAM can also incorporate a torque-limiting function into its inter-axle disconnect. Contact Us for more information about TEAM's Traction Control Systems.